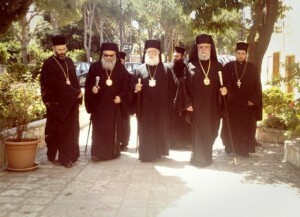 In support and solidarity with the Greek Orthodox Patriarchate of Antioch and All the East, His Beatitude Pope and Patriarch of the Church of Alexandria and All Africa Kyrios Kyrios Theodoros II and His Beatitude Archbishop of Cyprus Kyrios Kyrios Christophoros made a visit to Balamand Monastery, the University, and the Saint John of Damascus Theological Institute, in the company of His Beatitude our father Patriarch John X. Their Beatitudes blessed the breakfast table by their presence with the students, stressing their joy in taking part in the Institute’s daily program. His Beatitude Patriarch Theodoros gave a small speech in which he expressed the importance of the Theological Institute’s role in producing a zealous generation of youth, recalling the role of Patriarch Ignatius of thrice-blessed memory in this work. Afterwards, they visited the monastery, the Saint Joseph of Damascus Center for Manuscript Preservation, and the University. The Saint John of Damascus Theological Institute had the joy of meeting with the honored guests when the Institute’s administration, professors, and students welcomed Their Beatitudes with hymns of the Resurrection. Then there was a meeting with the professors of the Institute, during which the Institute’s dean, Bishop Ghattas Hazim, offered gifts to the honored guests. Then there was a meeting with the professors and students of the Institute, where His Beatitude John X welcomed the honored guests, after which His Beatitude Patriarch Theodoros gave a speech in which he talked about the Church of Alexandria from a historical perspective and about her missionary role in Africa. He likewise emphasized the importance of the bond between sister churches, quoting the Archbishop of Cyprus’ words that the Antiochian Church is considered the spiritual mother of the Church of Cyprus. After that, the Archbishop of Cyrpus gave a speech in which he affirmed the Orthodox Churches’ solidarity among themselves and especially with the Church of Antioch, during the current circumstances that she is experiencing. He expressed his strong denunciation of the kidnapping of the two bishops in Aleppo. His Beatitude announced the Church of Cyprus’ intent to open a theological institute following the example of Balamand, given the Antiochian Institute’s pioneering role in the Orthodox world. At the end of the meeting, the Institute’s choir chanted hymns and prayers for His Beatitude the Patriarch of Alexandria who blessed them with his presence.